After months of intense renovations, the large 'mikva' at the central Marina Roscha Shul is finally ready. After months of intense renovations, the large mikva at the central Marina Roscha Shul is finally ready. A mezuzah was affixed to its main entrance at an impressive dedication ceremony as it officially opened its doors to the public. 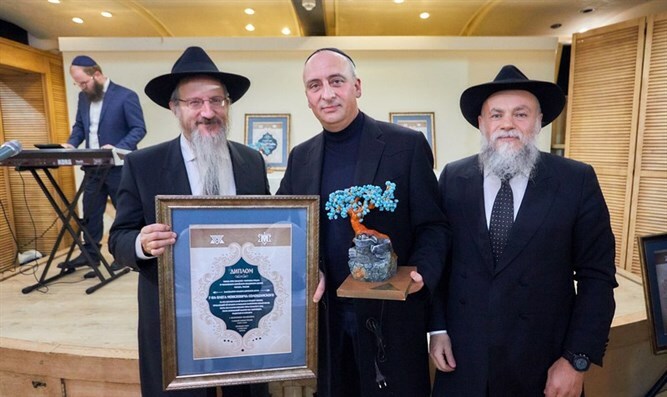 The event was attended by Chief Rabbi of Russia, and Rabbi of the central shul, Rabbi Berel Lazar. The mikva is located in the Jewish Community Center and is used daily by the many people who come to daven at the central Marina Roscha Shul at the same location. Ever since the new building opened, close to twenty years ago, it has turned into a focal point, drawing Jews from all over Russia, whether for a minyan, for Torah classes during the day, or a Chassidic farbrengen on each Chassidic date. This is in direct continuation to the many years of mesirus nefesh when all Chassidic gatherings and learning took place underground in complete secrecy. It is a known fact that the Rebbe cared deeply for the Jews in “that country” (behind the Iron Curtain), and took special interest in what was then a small wooden hut, sending his army of shluchim to bring new life to the Jews there. After the legendary wooden hut burned down, out of the embers, this large, teeming building came up, thanks to the untiring work of the Rebbe’s shluchim, under the leadership of the Head Shliach Rabbi Berel Lazar. The opening ceremony was tastefully emceed by the director of the Jewish Community Center, Rabbi Mordechai Weisberg, who thanked the esteemed sponsors, and praised the work of the President of the Federation of Jewish Communities in Russia, Rabbi Alexander Boroda and his wife, for their dedication and efforts in ensuring that the mikva be as beautiful, kosher, and convenient as possible. Rabbi Boroda is energetically working on raising the funds to continue renovations throughout the building of the Jewish Community Center, in honor of its twenty year anniversary celebrations.